I will stand and live by my word. I was the president of the VMI honor court. Our code there is a cadet shall not lie, cheat, steal, or tolerate those who do. That’s the most meaningful thing to me in my life. I tell the truth. I’m telling the truth today. A lot of us feel the Virginia Democratic Party has never been a very inclusive group.… And they always kind of marginalize African Americans without providing any grounds for advancement. This incident provides a useful insight into the surreal nature of Northam’s performance during the news conference. He served up a bizarre admixture of implausible lies, revisionist history, and weirdly flippant comments. In one example of the latter, he discussed the technique he used to apply shoe polish for blackface performances: “I used a little bit of shoe polish to put under my — or on my cheeks. And the reason I used a very little bit, is I don’t know if anybody has ever tried that, is you cannot get shoe polish off.” Hmm.… How does he know the subtle nuances of this process if he had made use of it only once? 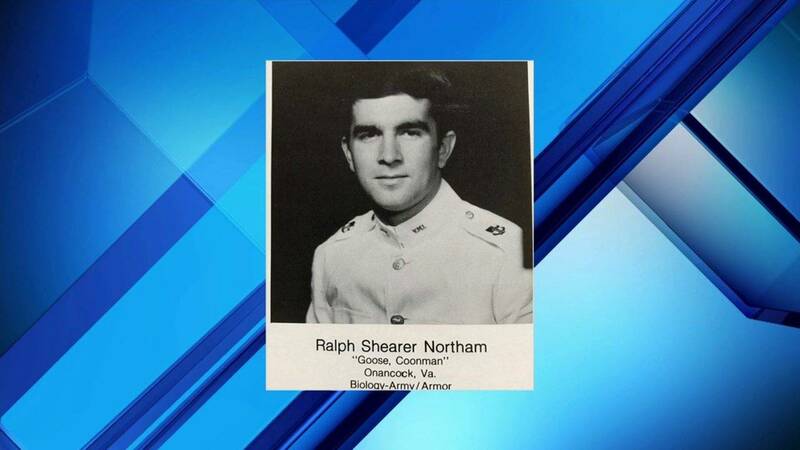 This brings us to Northam’s peculiar nickname, “Coonman,” which appears beneath his photo in the 1981 VMI yearbook. He claims he doesn’t know how he accrued that appellation: “There were two individuals, as best as I can recollect, at VMI — they were a year ahead of me. They called me ‘Coonman.’ I don’t know their motives or intent.” A more plausible explanation, considering his obvious expertise in the application of brown shoe polish as make-up, is that he earned the nickname by frequently donning blackface at frat parties and other less-than-genteel social occasions involving lots of alcohol. Now to the photo in the 1984 EVMS yearbook. Despite Northam’s claim that it landed on his page inadvertently, that’s unlikely. Were it true, he would ask the editors of the now-infamous tome to verify that publicly. He is almost certainly the guy in blackface. First, he is conversant with the nuances of using shoe polish as make-up and his nickname suggests that he was well known as a practitioner of that dubious art. Second, the person in the KKK hood is female. She’s a head shorter than her companion, slight of build, and situated next to him in a far more intimate fashion than any frat buddy would tolerate. 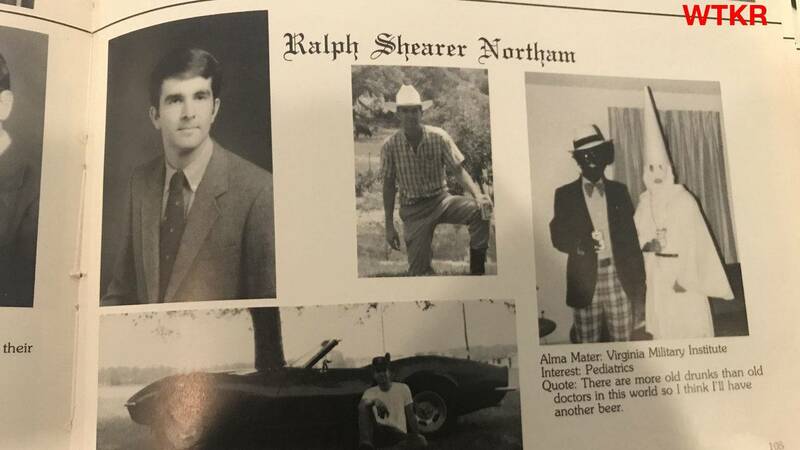 In the unlikely event that Northam’s story is true, he is having enormous difficulty convincing anyone that matters. Virtually every luminary in the Democratic Party has called on him to resign, including Virginia Senator Tim Kaine, Virginia Senator Mark Warner, former Virginia Governor Terry McAuliffe, former Virginia Governor L. Douglas Wilder, Virginia Attorney General Mark Herring, Virginia Rep. Jennifer Wexton, Virginia Rep. Elaine Luria, Virginia Rep. Abigail Spanberger, Virginia Rep. Donald McEachin, Virginia Rep. Bobby Scott, former Sec. of State Hillary Clinton, ad infinitum. In other words, it’s only a matter of time before Northam goes. The Democrats are burdened with a very sordid racial legacy, including slavery, the KKK, Jim Crow, segregation, white supremacy, civil rights, etc. The governor is an all too conspicuous reminder of this lengthy catalogue of crime. Indeed, considering how heavily they now rely on identity politics, he is about as radioactive as it gets. “Coonman” is a goner whether he knows it yet or not. His political executioners don’t do plea bargains.